Introduction—A conservative method of treating four delayed union stress fractures of the anterior mid-tibia is described, with an illustrative case history. Methods—Once diagnosed each of the patients was treated in a pneumatic lower leg brace with modified rest. The mean (range) age of the patients was 28 (24–32) years and all were involved in professional or amateur sports. The mean (range) duration of symptoms before diagnosis and definitive treatment of the four fractures was 9 (3–14) months. Results—Use of this technique avoided the need for surgery in this group of patients and allowed return to unrestricted activity an average of 12 months from presentation. Conclusion—The treatment is cost effective and avoids the often uncertain results and morbidity associated with surgery for these difficult stress fractures. For difficult delayed union stress fractures of the tibia (dreaded blackline), the use of a pneumatic leg brace in conjunction with activity modification should be considered. This may produce fracture healing and avoid the need for surgery. Stress fractures of the proximal and distal tibia are commonly encountered in clinical practice and their favourable outcome often reported in the literature. Less often seen and described are delayed union stress fractures of the mid-tibia, representing about 5% of tibial stress fractures.1 These fractures typically involve the anterior tibial cortex and may be referred to as “dreaded blackline fractures”, in part reflecting their generally poor prognosis and their propensity to progress to complete fracture. They were first described in 1956 in five ballet dancers by Burrows, who drew attention to the severe nature of these transverse “fatigue infractions” (incomplete fractures) in leaping athletes.2 In his series, these fractures were treated with excision biopsy or prolonged rest. Their potentially malign nature was highlighted by one case in which an assumed fatigue fracture progressed to a comminuted fracture of the mid-tibia after a leap. The inability of these fractures to heal was attributed to persistent provocative activity producing continued stress across the distraction surface of the bone. Subsequent reports of chronic non-union or delayed union tibial stress fractures have included various treatments: prolonged rest, immobilisation, or surgery.4–8 Rest has included avoidance of provocative activities, non-weight bearing ambulation, wheelchair use, and immobilisation with or without electromagnetic stimulation.2, 6, 8 Described surgical procedures include excision biopsy, drilling, excision and graft, and, more recently, intramedullary nailing.2, 4, 7, 8 A report of five military personnel in whom persistent localised mid-tibial pain was accompanied by a single linear transverse lucency and reduced medullary canal ratio recommended intramedullary nailing for active patients who do not improve with long term non-operative treatment.9 There have also been two reports of single professional athletes undergoing “prophylactic” intramedullary fixation of a persistently symptomatic stress fracture of the anterior tibia that had failed to allow return to play after grafting or drilling and immobilisation.10, 11 The results of surgery have not been universally successful, with described complications including persistent pain at the excision/graft site and pain after nailing either in the knee at the site of nail insertion or proximally around the screws of locked nails. In some cases these symptoms decreased over time but typically they restricted activity levels. This technique is typically that advocated for the less troublesome and more commonly described proximal and distal tibial stress fractures. More recently this approach has been augmented with the use of pneumatic lower leg brace allowing more rapid return to play.12–14 This study reports the use of modified rest and a pneumatic lower leg brace in athletes with diagnosed mid-tibial shaft delayed union stress fractures. Three patients with four mid-tibial delayed union stress fractures were seen and treated between 1996 and 1998. The mean (range) age of the patients was 28 (24–32) years. There was one man (a marathon runner) and two women (a professional ballet dancer and a netball player) (table 1). All patients had well localised anterior mid-tibial pain on exertion, a palpable tender lump, and fractures diagnosed on lateral radiographs of the tibia. In case 1, additional tomograms were performed to assess healing. The duration of symptoms before diagnosis and definitive treatment was mean (range) 9 (3–14) months. Once diagnosed, each of the patients was instructed to wear a long Air-Strirrup leg brace with anterior pad (Aircast Inc, Summit, New Jersey, USA) while performing activities of daily living and allowed to ambulate freely once walking was pain free. During splint usage, patients were asked to refrain from any ballistic activity but encouraged to cross train using non-impact aerobic machines, cycling, and swimming. Once significant radiologically detectable healing had occurred, intermittent usage (weaning) of the splint was advised, particularly during exercise periods. Attention was paid to smoking, diet, and, in the two women, menstrual history. A 24 year old ballerina presented for a third opinion after 14 months of localised right mid-tibial pain. A radiograph taken 10 months before her presentation to us showed a clearly demarcated transverse fracture in the mid-tibial diaphysis (fig 1). She had been prescribed three months of rest after which she made an unsuccessful return to dancing. On presentation to us, she had a localised painful lump with increasing pain with plié and particularly jumps. She was provided with a splint and encouraged to continue with non-painful activities and soon was able to use the bar and perform centre activities but avoided all jumps. After 13 weeks there was some radiological evidence of healing; tomograms were used in an attempt to assess further fracture healing but were not advantageous and thus not repeated. 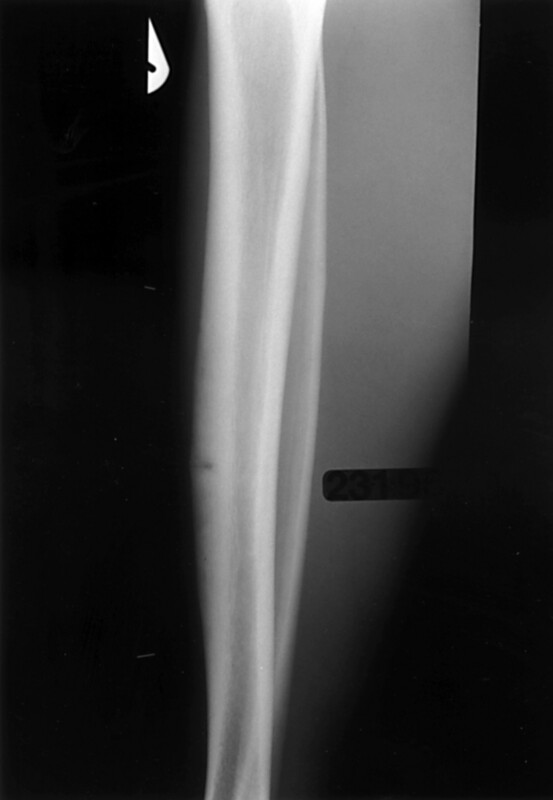 At 20 weeks the fracture appeared radiographically to be healed (fig 2); the splint was gradually discontinued, and she was able to return to dancing. It is significant that she was oligomenorrhoeic and became amenorrhoeic when in training (menarche aged 13 years); she had used the combined oral contraceptive pill sporadically. She was a smoker (10 cigarettes/day) with a low calorie diet but with adequate calcium intake. A recent bone mineral density assessment was within normal limits for the lumbar spine and femoral neck. Accordingly she was advised to continue taking the combined oral contraceptive pill, increase the calorific content of her diet, and refrain from smoking. Case 1: lateral radiograph of the tibia showing a clearly demarcated transverse fracture (“dreaded blackline”) in the mid-tibial diaphysis, thickened anterior cortex, and a narrowed medullary canal. Case 1: follow up lateral radiograph of the tibia after 14 months showing that the fracture had healed. All patients became symptom free and returned to their former level of activity in a mean (range) of 12 (11–14) months (table 1). Splints were used continuously for a mean (range) of 21 (13–28) weeks and intermittently for 5 (0–13) weeks. Compliance with splint usage appeared good but was not assessed quantitatively. For the duration of treatment each patient used one splint per fracture; the splints were well tolerated. Radiologically assessed healing was complete in three of the fractures in a mean (range) of 8 (7–11) months. The netball player had bilateral fractures, of which the right showed a persistent oblique lucency with scant periosteal reaction, despite the patient being symptom free and returning to activity. Previous reports have highlighted the difficulties associated with the treatment of delayed union stress fractures of the anterior cortex of the tibia. We report a new approach to management of these problematic fractures based on modified rest and the use of a pneumatic leg brace. This technique is founded on extrapolation of the successful treatment of simple tibial stress fractures with pneumatic braces. Other conservative management strategies of these difficult stress fractures have been previously reported. In Orava's series of 17 cases,8 the eight patients who were treated by rest from physical activity had symptoms for an average of 4.6 (3–6) months before diagnosis and healed after 6 (3–10) months. The remaining nine patients came to surgery (drilling) having developed a delayed or non-union, suggesting that the eight treated conservatively may have had a less severe injury. Rettig et al6 described eight cases; seven of these patients were successfully treated with rest and pulsed electromagnetic field therapy, returning to sport after an average of 8.7 months. On that basis they recommended a minimum time of three to six months of conservative treatment before considering surgical intervention. We would concur with this view, but would suggest a minimum of six months of conservative treatment in conjunction with the use of a pneumatic brace instead of or in addition to electromagnetic therapy. The brace is both inexpensive and readily available. The rationale for the use of a pneumatic brace is based on the hypothesis that elevated osseous hydrostatic and venous blood pressure produces a positive piezoelectric effect which stimulates osteoblastic activity and thus fracture healing.13 It has been shown in a canine model that a pressurised brace produces a stronger healed fracture with higher density periosteal callus rather than increased callus volume.15 Furthermore, earlier mechanical loading of the fracture may positively affect bone remodelling as may the efficient fracture immobilisation afforded by the pneumatic splint. The clinical features in these patients were consistent, comprising localised tibial pain on exertion and a tender tibial swelling. Of concern, there was a significant time delay until definite diagnosis and management. This may firstly reflect ignorance of this problem and secondly the natural history of these lesions as the diffuse tibial pain of shin splints becomes more localised.16 Each of our patients had characteristic radiographic findings of a thickened anterior tibial cortex and narrowed medullary canal in association with a typical horizontal fissure. Unlike Orava and Hulkko,1 we did not find tomograms to be a useful adjunct to fracture assessment but instead found lateral radiographs to be of most help. In one case (case 3), an oblique fracture line was seen which may have represented an atypical rather than true dreaded blackline. This has not previously been reported and in this patient, who had bilateral symptoms, this fracture line was recalcitrant despite the fracture becoming asymptomatic and the patient returning to netball. Similar incomplete radiological healing has been described in relation to anterior tibial striations and in stress fractures of the navicular bone of the foot.3, 17 Anterior tibial striations may represent early delayed union stress fractures particularly when they occur as solitary lesions but are more typically found as multiple defects. The precise relation between anterior tibial striations and stress fracture is unknown as there are no prospective longitudinal studies describing the natural history of these lesions. A conservative method of treating delayed union stress fractures of the anterior tibial cortex is described using modified rest and a pneumatic lower leg brace. Use of this technique has avoided the need for surgery in this group of patients and has allowed return to unrestricted activity. The treatment is cost effective and avoids the uncertain results and morbidity associated with surgery for these difficult stress fractures. The authors received no financial benefit and have no conflict of interest with Aircast Limited Partnership who kindly supplied the braces used in this study. Orava S, Hulkko A. Stress fracture of the mid-tibial shaft. Acta Orthop Scand1984;55:35–7. 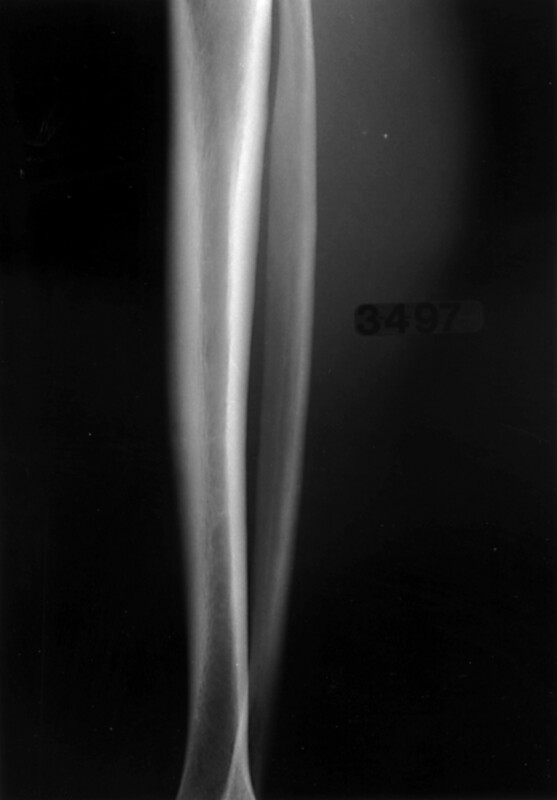 Burrows H. Fatigue infraction of the middle of the tibia in ballet dancers. J Bone Joint Surg [Br]1956;38:83–94. Miller E, Schneider H, Bronson J, et al. A new consideration in athletic injuries. Clin Orthop1975;111:181–91. Green N, Rogers R, Lipscomb A. Nonunions of stress fractures of the tibia. Am J Sports Med1985;13:171–6. Blank S. Transverse tibial stress fracture: a special problem. Am J Sports Med1987;15:597–602. Rettig A, Shelbourne K, McCarroll J, et al. The natural history and treatment of delayed union stress fractures of the anterior cortex of the tibia. Am J Sports Med1988;16:250–5. Beals R, Cook R. Stress fractures of the anterior tibial diaphysis. Orthopedics1991;14:869–75. Orava S, Karpakka J, Hulkko A, et al. Diagnosis and treatment of stress fractures located at the mid-tibial shaft in athletes. Int J Sports Med1991;12:419–22. Chang P, Harris R. Intramedullary nailing for chronic tibial stress fracture. Am J Sports Med1996;24:688–92. Barrick E, Jackson CB. Prophylactic intramedullary fixation of the tibia for stress fracture in a professional athlete. J Orthop Trauma1992;6:241–4. Plasschaert V, Johansson C, Micheli L. Anterior tibial stress fracture treated with intramedullary nailing: a case report. Clin J Sports Med1995;5:58–62. Dickson T, Kichline P. Functional management of stress fractures in female athletes using a pneumatic leg brace. Am J Sports Med1987;15:86–9. Whitelaw G, Wetzler M, Levy A, et al. A pneumatic leg brace for the treatment of tibial stress fractures. Clin Orthop1991;270:301–5. Swenson E, DeHaven K, Sebastianelli W, et al. The effect of a pneumatic leg brace on return to play in athletes with tibial stress fractures. Am J Sports Med1997;25:322–8. Dale PA, Bronk JT, O'Sullivan ME, et al. A new concept in fracture immobilization. Clin Orthop1993;295:264–9. Batt M. Shin splints: a review of terminology. Clin J Sport Med1995;5:53–7. Daffner RH. Anterior tibial striations. AJR Am J Roentgenol1984;143:651–3.